It's Spring Break for me, which means that half my school is currently in Cancun soaking up the sun while campus is slammed with two feets of snow. I'm luckily heading to the beach this week as well, as Atlanta is just a little too cold for me right now. Since I'm seeing everyone else in the sun and I'm almost there, I figured I'd share my picks for what would make spring break even better! All I need now is a cold sweet tea and my beach chair! Let me know if there's anything you'd add to this spring break list! What are you doing for Spring Break, or where's your next vacation? Hi hi y'all!! So for those who don't know, I'm big into bling! I love wearing all types of jewelry- bracelets, rings, necklaces, cuffs, earrings, you name it! I wanted to show y'all my every day jewelry plus introduce you to maybe the best subscription service ever called Rocksbox. First things first: my everyday bracelets include the ever present, ever sratty bangles from Alex and Ani. I was given a set by my cousin when I graduated high school and since then, my collection has grown. This summer, my parents added onto my collection with a July birthstone bangle and a Buddha bangle. I also always wear my Michael Kors watch because I try not to be late to things (apparently I can still tell time) I add onto my stack with my Gamma Phi Beta Alex and Ani bangle, my David Yurman cuff and a Little Words Project bracelet reminding me to always stay strong. For those who follow me on Instagram, you would have seen on my Instagram story on Monday, that my parents added on yet again to my Alex and Ani stack. After I called them with my news of being elected Chapter President, they surprised me when I got home with a moon-themed stack and a bracelet that reads "To the moon and back". It definitely made me get a little emotional. Now moving on to the juicy part of the post... this past month, I got to test out a jewelry subscription box called Rocksbox! Rocksbox is a subscription box for $19 a month where you can rent three pieces chosen by a stylist. At the end of your month, you can send back all three of your pieces or keep as many as you want and purchase them for a discount (I sent back everything this month, but I'm looking forward to next month). I also got to test out the Rayne necklace in Ivory Pearl. I love love love this necklace and I've wanted to buy it in many different stones before, but I never actually got around to it. I liked testing it out in a more neutral stone. I didn't end up buying this piece, but I thought about it and I'm definitely thinking about getting it in a neutral rose gold color. This was the Slate necklace that I wasn't a huge fan of. I also always wear my Nava NY Gamma Phi Beta ring with CZ stones on my right hand. I usually wear other rings in addition, but this is my go-to everyday ring. This month (in October), I received two pieces by Kendra Scott, one of my favorite jewelry designers and a piece by Slate. I loved the Kendra Scott pieces and barely ever took them off. I was much less of a fan of the Slate necklace and didn't really wear it much. My favorite piece hands down was the Danielle earrings in Abalone Shell by Kendra Scott, seen above with my BaubleBar initial studs. I actually have these earrings in a slightly smaller size already but it was fun to test out the larger size! I'm really excited for the next month of Rocksbox! I'm getting a Kendra Scott Elisa necklace in Rose Quartz, Kendra Scott Alex earrings in Rose Quartz, and A.V. Max Knotted Twist Cuff in Rose Gold. See a pattern? Rocksbox already knows my love of rose gold. I hope y'all liked getting to see what I wear for jewelry on a daily basis and getting to see my test run of Rocksbox. If you're interested in Rocksbox, you can use "missmollyemxoxo" at checkout, and you get your first month free! Happy, happy Tuesday y'all! Hope everyone is having a fab week as we all transition into the fall season! It's finally cold enough to break out my fave fall essentials and I'm extra excited for it! This is the Gigi New York Chelsea Crossbody in Crimson Pebble Grain (bought at a blogger discount). It has a detachable chain that I usually leave on! Coach Wristlet (had this for two years and swear by it! )- the one I have is discontinued, but this is the closest thing to it! Molly Em business cards for handing out to friends, family, and brands! These are from Moo.com. My handy-dandy iPhone! The case is from Sonix, and the blue glitter skin is from Etsy. Have a fabulous fall Tuesday! Hope everyone's week is absolutely fabulous! This week is a little crazy for me, with midterms starting up and things kicking into swing on campus (like next week, please check and make sure I'm doing things other than attending campus events and work, because I might forget what sleep is). 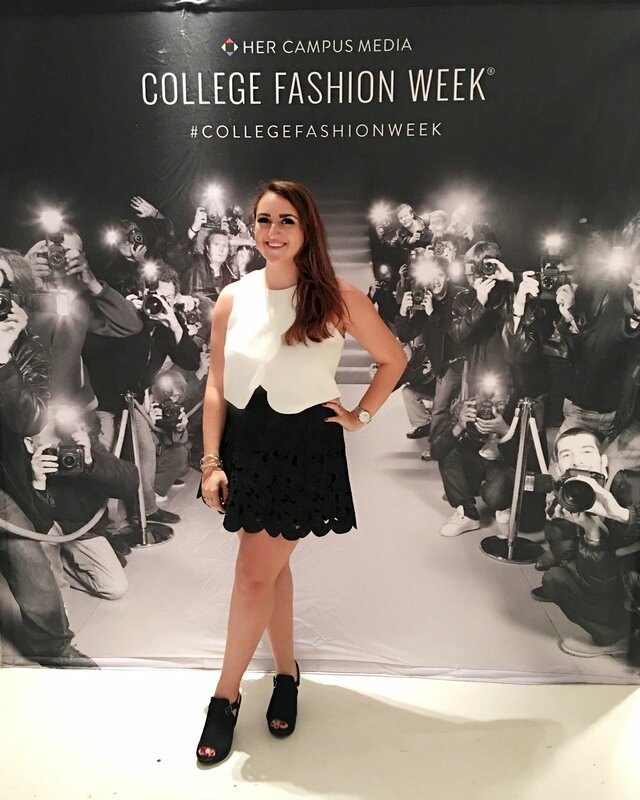 However, this weekend, I got to do something completely out of the ordinary, and attend College Fashion Week here in NYC! I was lucky enough to attend as a Social Media correspondent, covering the entire event on Her Campus' Snapchat story for the night! 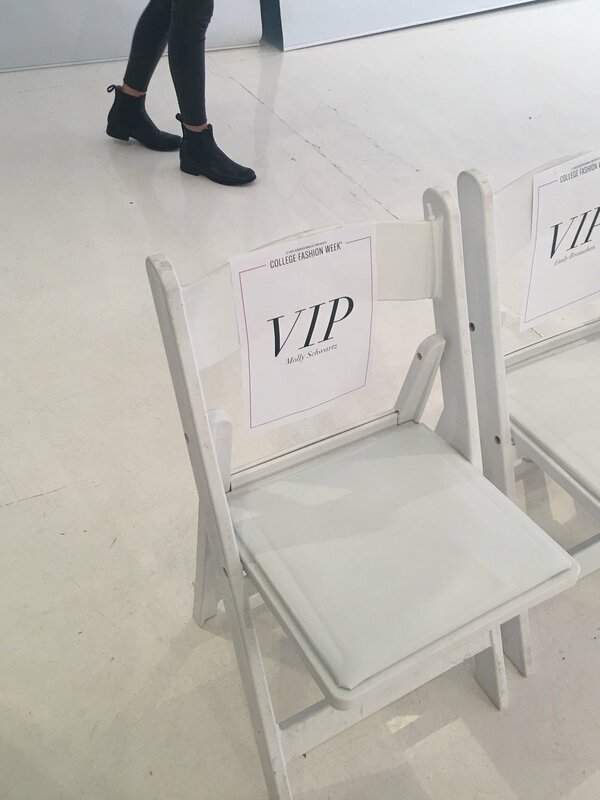 It was an amazing experience to even attend the event, and because I was attending and covering the event for Her Campus, I got to sit in VIP/Press seating and see everything from the ideal perspective! 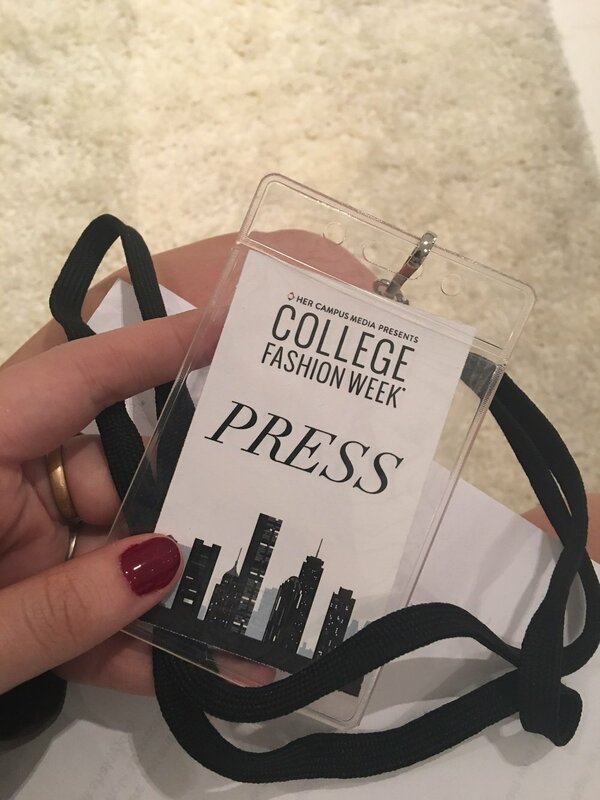 If CFW is coming to your city (Chicago and LA are the next two cities that CFW will come to this year) in the future, I definitely recommend going! As I was covering the show for Her Campus, I got a chance to go behind the scenes in many aspects- I got there early and got to see the venue get set up for the show, and I was able to go backstage and see the clothing and models beforehand, and see all of the vendors before anyone got there! 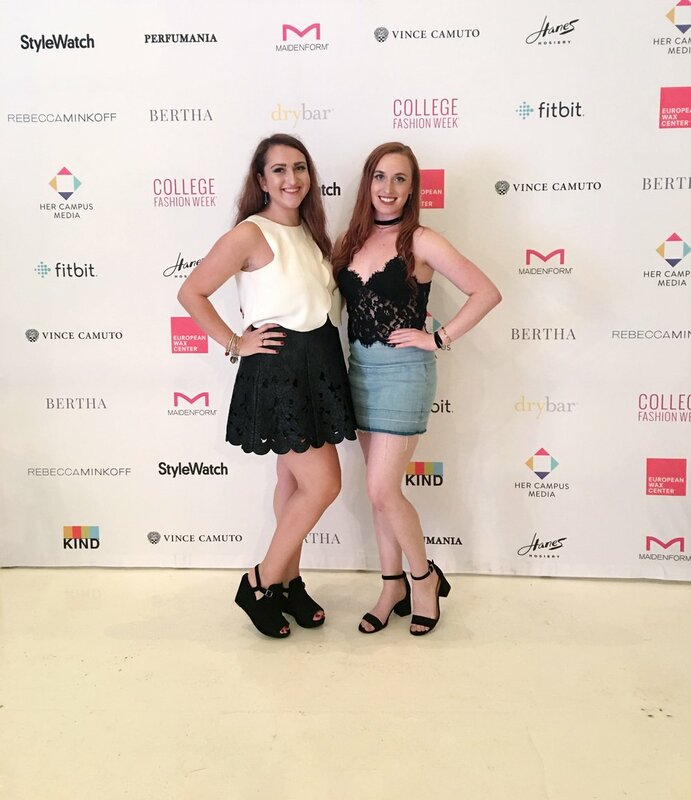 The sponsors for the event did an absolutely amazing job- some of them were Fitbit, Vince Camuto, Bertha Watches, Rebecca Minkoff, Drybar, KIND bars, Maidenform, and Style Watch! One of the coolest parts, not going to lie, was getting a VIP swag filled with some amazing gifts from the sponsors, the biggest being a Fitbit Flex 2! My Fitbit recently stopped working and I'm looking forward to trying out their newest invention! Some other items from the swag bag that I'm excited to use are the Maidenform tights and thigh highs that were included, and my personal favorite, a bag of Skinnypop! Here's a peek into one of the coolest nights so far of this semester! I think the best parts of the night were getting to attend with a close friend of mine, Sarah, and getting to see two of my favorite brands, Ali & Ariel (who I've worked with before here and here), and Bow & Drape (keep your eyes peeled for our collab soon! ), hit the runway! It was an amazing night of #girlpower and creativity and fashion all over the place. Also shout out to Emily from Fashion Daydream! I met her and her roomies from Pace University here in the city and they are the sweetest! Emily was covering the event on Her Campus' Instagram story and you can see her take on the night here! Have a fab day, loves! Hi hi y'all! Hope everyone is doing super well as the second week of January and 2016 draws to a close. I'm trying to fit all my last minute errands and visits in before I head back to school next week for another round of classes and such! As the holiday season ends and I start thinking about another year, another semester, and transitioning into a newer and colder season (Atlanta has been ridiculously mild compared to New York this winter), I've been drawn to much different products. Here's a peek into some things I've found myself eyeing recently. Flats, Tassel Necklace (on sale! ), Phone Case, Salt Spray, Rayne Necklace, Turtleneck sweater, Monogram necklace, Jewelry tray, Kendra Scott earrings, Catbird ring, Warby Parker glasses, Madewell plaid skirt, Solid Shampoo, Pearl Studs, Ray-Ban Sunnies, Travel Mug, Sweatshirt, Journal, Leather Phone Case, Yoga Tank, Glitter Keds, Emoji Studs, Champagne glass, Notebook, Jewelry dish, Watch, Print, Makeup Bag, Travel Mug, Pearl Cuff, FP Lace-Up Shirt. I recently found out about Bow and Drape, a GLITTERY AS HELL customizable sweatshirt company and I've fallen in love. 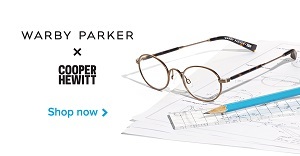 They're super affordable and can we just talk for a second about how darling everything in their shop is? I'm obsessed to say the least. I found out about Furbish Studio from another blogger, and I lowkey want all of their emoji prints. I'm really into this whole lace-up trend, even though my mom says it's just bringing the seventies back to haunt adults, but I'm a fan! I'm really clumsy. I'm putting it out there. I also really like hot drinks, considering it takes a lot to get me out of bed and into the cold. Cue travel mugs. This way, I can have my hot chocolate or coffee and not promptly spill it all over myself and get burned. Okay, I'm a southern girl. We all love Kendra Scott. It just took me about 5 years to get on trend, y'all. But DANG. I love her jewelry, I don't care how basic it makes me. Especially in Abalone?? So glittery and shiny and beautiful. These are just a few specifics I'm in love with that I pulled out of the collage, but tbh, if everything from this collage magically found its way into my closet, there wouldn't be an argument from me. (My wallet, on the other hand, is another story). Hope y'all enjoyed! What are you craving this month?